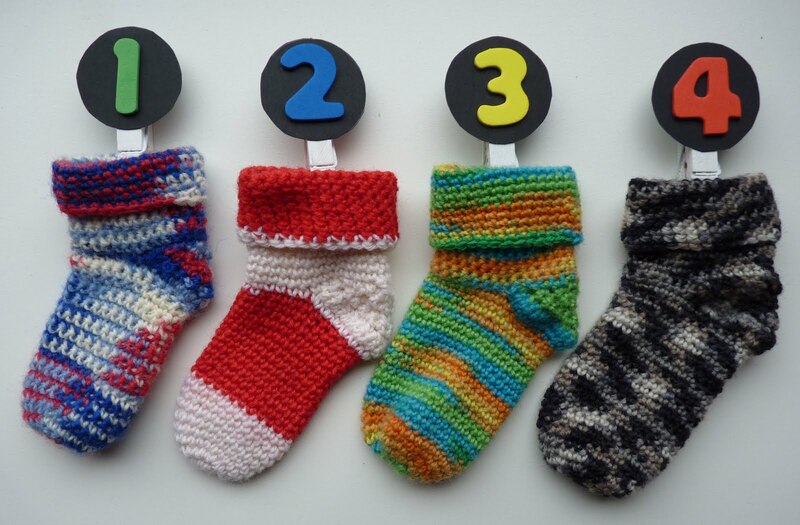 Advent Socks - Kit Giveaway! 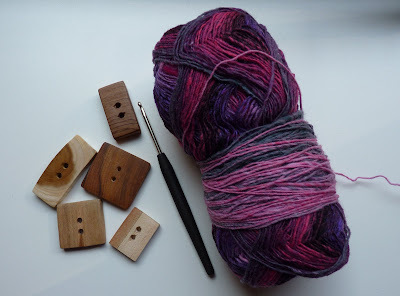 As I plough my way throught my little socks, I'm beginning to accummulate quite a number of leftover balls of yarn, so just to make life a bit more exciting in the Gingerbread House, I thought I'd organise a little giveaway. What's in the Advent Sock Kit? and ... wait for it! What do you have to do? Leave a comment (and please leave a link to your blog or your email address so I can contact you if you're the lucky winner of all this swag, hehe. Comments that contain personal info will not be published but you will of course be included nonetheless!) If you can't leave a comment but you know me under another nom-de-plume in cyberspace, send me a PM. I'll compile a list of interested people and put their names into a hat ... And on the 20th August, I'll get one of the unwitting protagonists in my cyberspace life (Mr Gingerbread or my freshly-married Gingerbread Sister, who will be visiting) will pull a name from a hat with a hugely dramatic flourish. 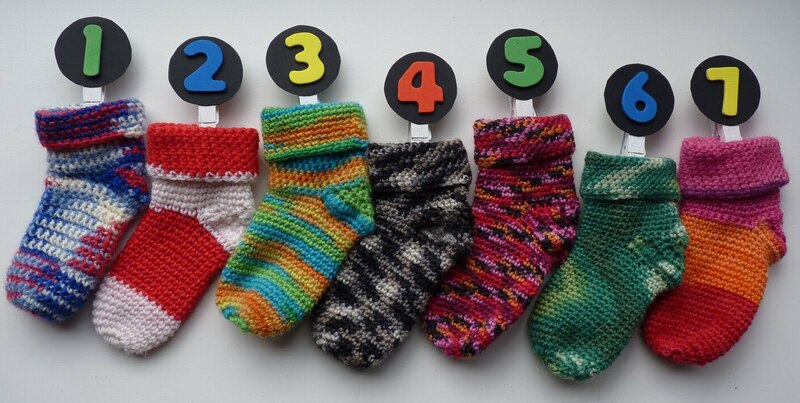 After that, it's up to you to get down to work and start churning out your socks in time for Advent! I've got seven done. I'm flying through them! 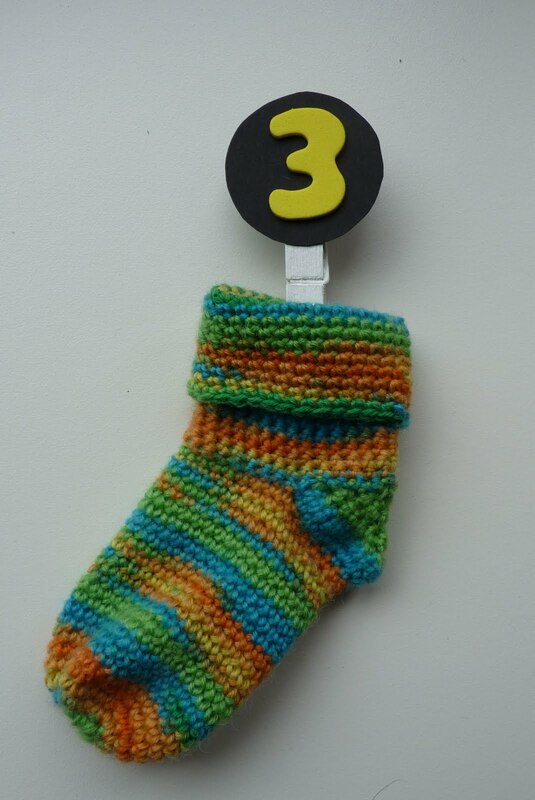 I did three little socks on Sunday because I discovered that I can manage one in under an hour - and since Sunday was a day of sloth, I churned out three little socks. Strangely enough, handicrafts were (and for some people still are) considered 'work' and thus would've been forbidden on the Sabbath. It's interesting to remember that what we nowdays choose to do recreationally - crochet dishcloths, knit socks, sew quilts - was part of the drudgery of women's daily life. It reminds me of the Laura Ingalls Wilder book in which the family almost has a conniption of joy when they sell a couple of cows for a sewing machine ... a sewing machine! It meant - brace yourselves - that they didn't have to hem the bedsheets by hand. Imagine a day spent boiling water and lugging heavy pots and pans, steeping laundry, then scrubbing and wringing it out to dry, followed by the preparation of a family dinner from scratch - and then the joy of hand-hemming a sheet by the light of an oil-lamp for recreation. We're going to Ireland next week for a few days and we're working hard in the meantime to get walls plastered and primed here in the Gingerbread House. This flurry of activity is necessary because all of my male relatives will grill us on how far we've progressed in our renovation efforts. When I'm in Ireland without the Gingerbread Husband, I'm made aware of how completely inadequate my reports are. I can tell them what we've been doing but they're not really interested in our success stories, they want to know about the disasters. And they want to fix them. Strangely, though, all the DIY suggestions involve 2x4s. A 2x4 is a plank of wood that's 2 inches deep and 4 inches wide - in Ireland it's pronounced a "toobefore". Apparently it's like a cup of tea in DIY terms: it cures all ills. If your floor is wobbly, just shore it up with 2x4s and pour a few gallons of liquid concrete on it. Instable wall? Tack a stack of 2x4s to it and cover it with plasterboard. Leaking toilet? Just take a 2x4 and ... oh, dear. You get the idea. I don't know much about DIY and I usually just do what I'm told, so I'm not sure if I'm passing on this valued advice as it was given. In any case, there's always a piece of timber somewhere in the mix. Yowzers. 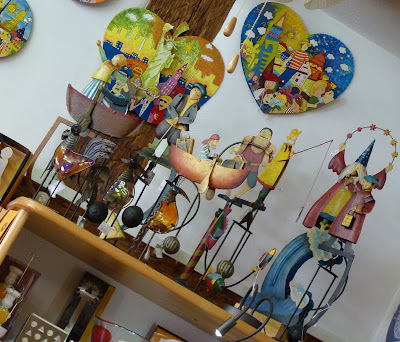 I started this blog 6 months ago and now have over seventy posts! Some of you have even been kind enough to say complimentary things about what I write (without me sending you money in the post to do so). Thank you very much. And apologies to the Nice American Lady who snorted milk out through her nose whilst reading my blog. I hope your keyboard is okay again. Sadly, though, you are going to get me in trouble with the Gingerbread Mammy, who is sure to give me a telling-off for my wilful disobedience in matters of career choice and freetime perusal. 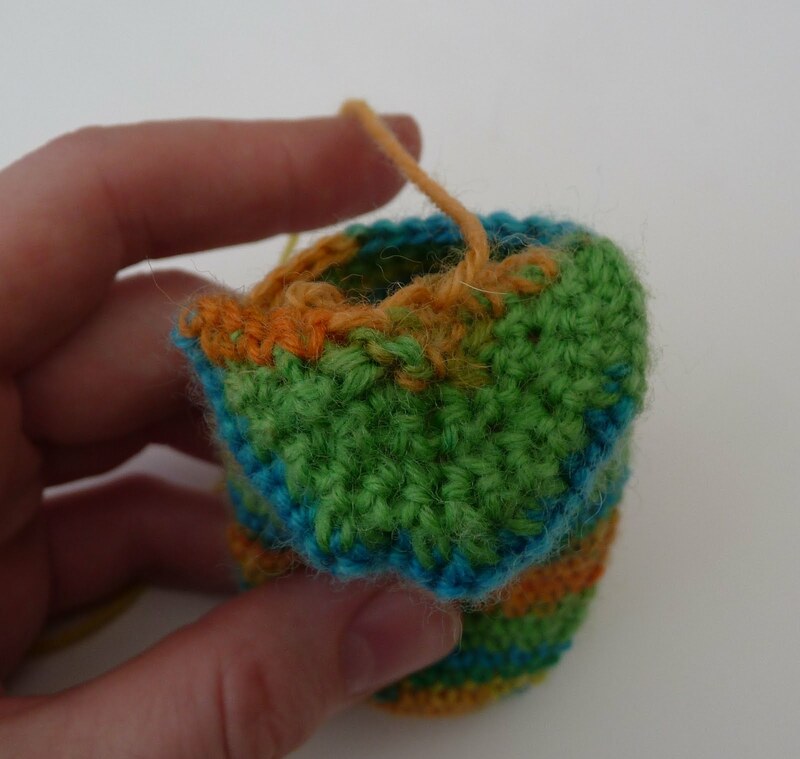 I shouldn't be sitting here chatting to you and making miniature crochet socks: I should be topping bestseller lists and giving JK Rowling writer's tips. You don't know what this is going to lead to, honest. Let me start by telling you that there are a lot of us in the Gingerbread Family. When we assemble, there are enough of us to form a team for most competitive sports. Nowadays, when partners and spouses are added to the mix, we even have enough bodies to stock the substitute bench. Growing up, we Gingerbread Kiddies were like the von Trapps, except with a lot more slaps and hair-pulling. And, no, my mother never made us Lederhosen out of the bedroom curtains, nor did we do singing expeditions in the Wicklow mountains. Given the fact that she was usually outnumbered by her unruly offspring, my mother had to call upon divine intervention for support. We kiddies had an uncanny knack for starting fights in moving vehicles: why not make driving even more of a challenge by starting a full-scale war over who was going to sit in the best armchair in front of the TV when we got home? Of course, we never realised that high-pitched squabbling was severely endangering our chances of getting home in one piece at all, but before my mother could pull over the car to make us behave, some sibling or other usually got an accidental knock from a misplaced elbow or a dislodged schoolbag, and heartfelt sobs brought the argument to a close. "There!" my mother would say, glaring at us through the rearview mirror. "God did that!" It never occured to us kiddies to question why the Great and Almighty Supreme Being might be lurking in the back of a rattly blue Renault, waiting to dole out a clatter to a naughty Gingerbread instead of being off somewhere parting seas or supervising earthquakes. But if your Mammy says it is so, then it must be the case. Right? Right. In later years we realised that self-inflicted injuries were generally not the work of an all-seeing God with Super Nanny tendencies, but simple cases of stupidity, bad timing or - in my case - poor spatial vision. God, however, continues to side with my mother on most matters, especially career advice. When one of us shows any special abilities - musical, artistic, crafty - my mother will use the opportunity to call upon her buddy, the Almighty. "You have a God-given talent!" she'll snap. "He gave it to you, so use it!" It sounds vaguely threatening. My mother is formidable enough, backed up by God - well, you don't have much of a choice. And any disinclination towards taking Mammy+God's advice is just pure obstinacy. For example, I am The Writer of the family, which, I suspect, is an honour bestowed on me primarily because I can spell and know where to put apostrophes. The fact that I am not churning out bestsellers is just pure stubbornness on my part, as far as Mammy+God are concerned. The thing is, though, God helps those who help themselves and so far, He has not been very co-operative in answering my prayers for winning lottery tickets. I also specifically asked for a millionaire husband, but got Mr G instead. Not that I'm complaining, mind, but it's hard to take His career advice when I have to go to my normal day-job as well. I'd be happy if my bank manager just rang up and said, "Mrs Gingerbread, your mortgage has been paid off by a mysterious benefactor. 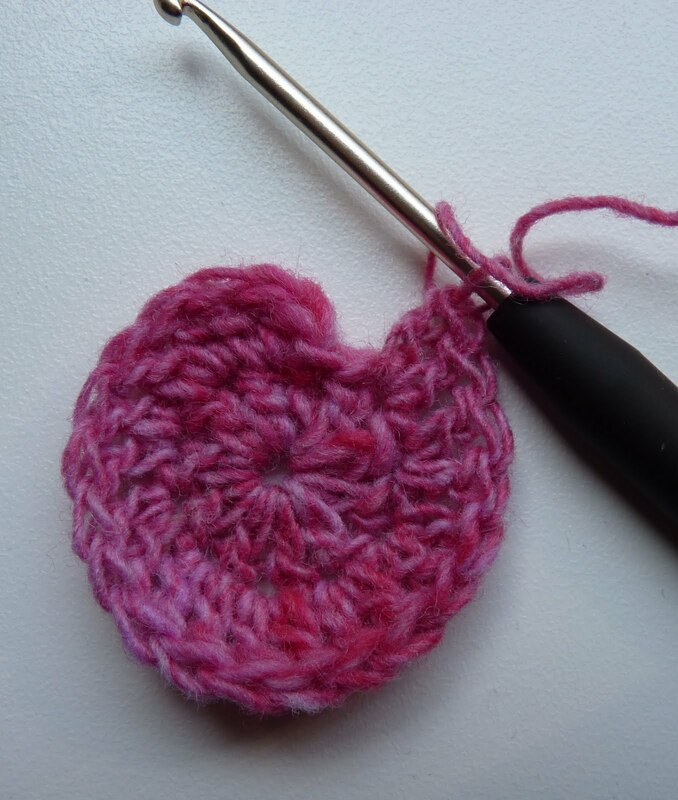 Devote your days to writing and crocheting!" But sadly I wait in vain. Oh, well. Never mind. I'm just happy that I can gather my wits long enough to write a few paragraphs every week or so. And if that's okay by you, I'll just keep going as is. The sock yarn in shades of black, white and grey is a leftover from this hat (don't worry, it's a man's hat. Gladys has not been attacked and eaten by headwear). 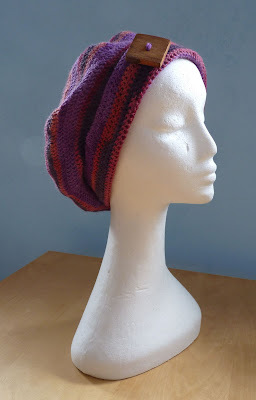 This hat - without meaning to be dramatic - almost cost me my sanity. 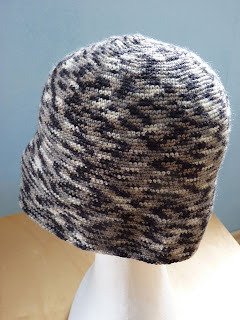 Mr Gingerbread complains that I never make anything for men, so I decided to use my black'n'white flecked yarn to make a Simple Sock Yarn hat, mansize. Grrrr. Never again. 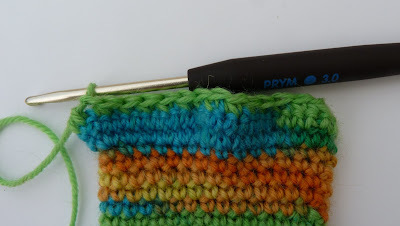 What makes working with a sock yarn interesting is the stripe and the changing colours - a sock yarn that merely produces a fleck before changing to the next colour is very, very boring. So during the time it took me to finish this hat, I crocheted six cushion covers, two baby blankets, two berets and a scarf (I am nothing if not prolific). Oh well. 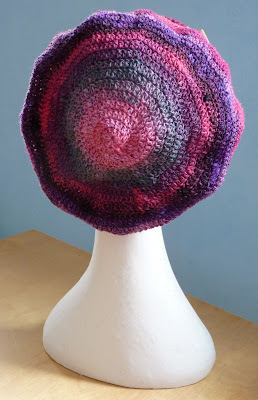 At least the leftover yarn made a nice sockette. I thought I'd show you some pictures of one of my favourite shops. 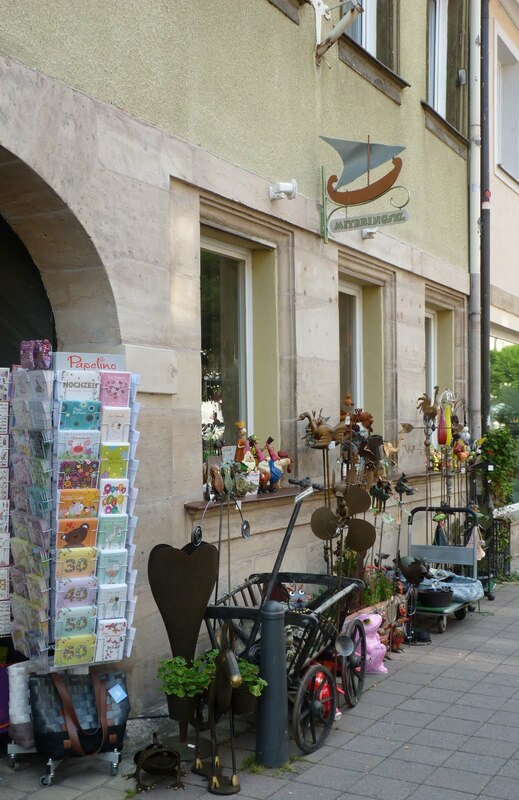 It's called Mitbringsel, which is a great German word for the little gift you take with you to someone's home or a souvenir you bring home. 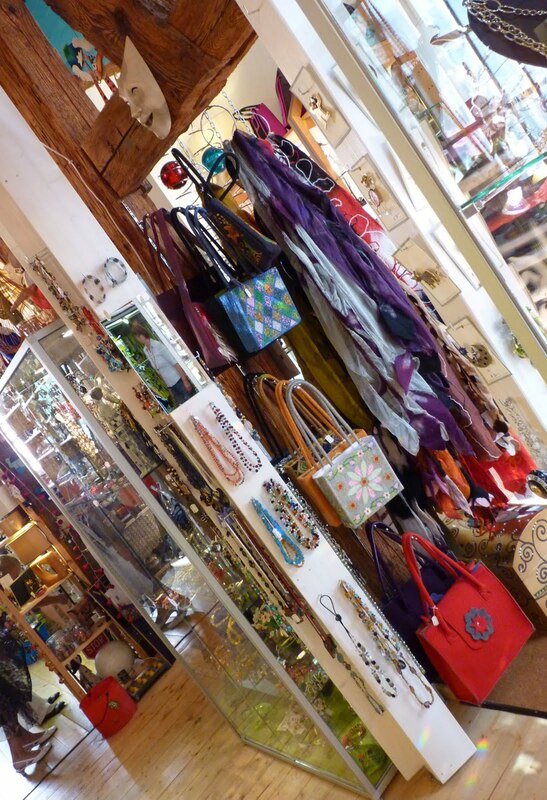 This shop is like an Aladdin's cave and it's jammed to the rafters with all kinds of wonderful things. Really. Jammed to the rafters! Okey-dokey, artichokeys. 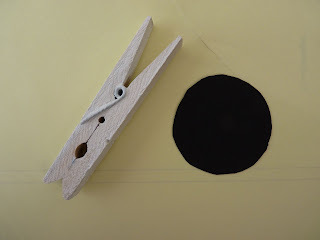 Today we're going to make the Big Button Beret! And the second thing is, of course, the button. The hat is nice without a button, but an unusual button or even a crochet flower makes the beret a bit special. Right-ho. Enough of the speeches. Let's get down to work. This is not really a pattern, more of a loose guideline. 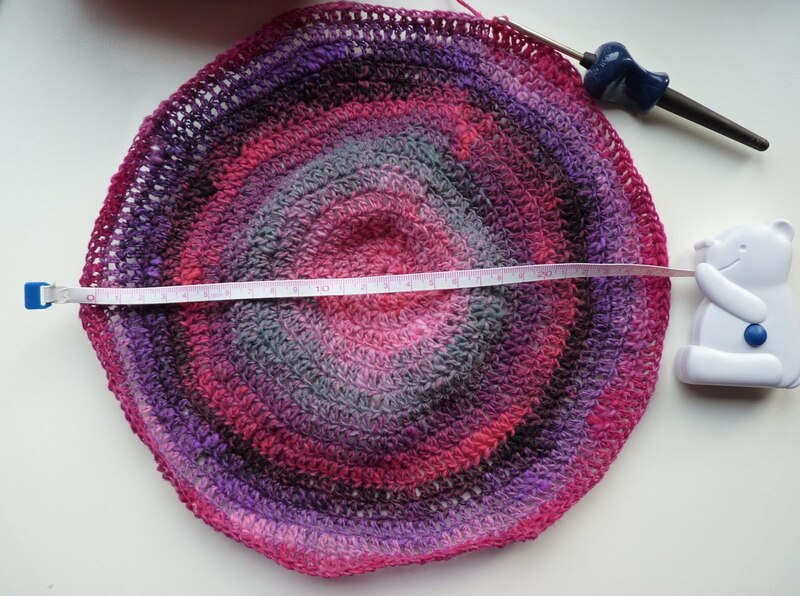 Sock yarn is thin, so you need more rounds to reach the desired diameter. 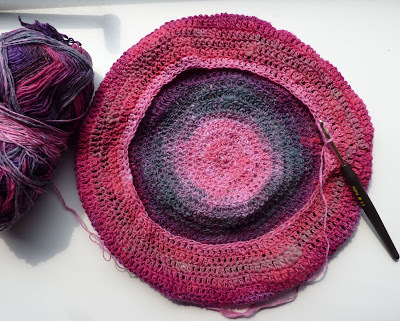 A thicker yarn (DK or WW) and a bigger hooks means fewer rounds - fewer rounds mean the hat will be finished even more quickly. Right. We're really starting this time. 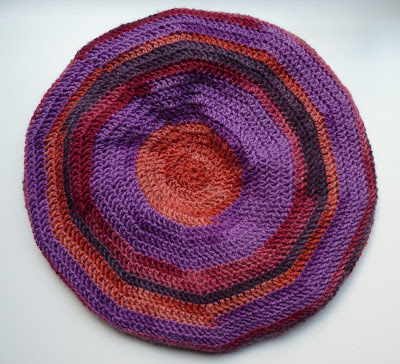 This pattern uses American crochet terms. British terms are in [brackets]. 2-DC together= [2-TR together] (Yo, Insert hook in next st, yo, draw yarn through st, yo, draw yarn through 2 loops on hook) twice, yo draw yarn through 3 loops on hook. Round 2: 1 ch, 2 DC [TR] in same stitch. 2 DC [TR] in next nine stitches. Join with slip stitch. Round 6: 1 ch, 1 DC [TR] in same stitch and 1 DC [TR] in next three stitches, *2 DC [TR] in next stitch, 1 DC [TR] in next four stitches. Repeat from * around, ending with 2 DC [TR]. Join with slip stitch. Round 7: 1 ch, 1 DC [TR] in same stitch and 1 DC [TR] in next four stitches, *2 DC [TR] in next stitch, 1 DC [TR] in next five stitches. Repeat from * around, ending with 2 DC [TR]. Join with slip stitch. Aha! Do you see what's happening here? We're creating a big, flat circle by simply increasing the number of DCs we do between each double-DC [TR] in every round. In round 8 you do 1 DC in the six stitches between the double-DC [TR], in round 9 you do 1 DC in the seven stitches between the double-DC [TR]. And so on. 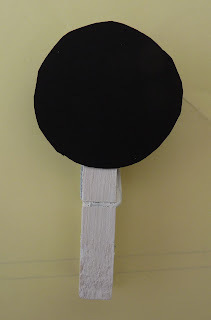 But what should I do if my circle is curling? Well, a little curling isn't a problem. It doesn't have to be completely flat. Look! a) go up a hook size. I started with a 3.00 mm hook but found I was crocheting a bit tightly and my hat was curling into a saucer shape, so I switched to 3.50 mm to adjust my tension. b) You can repeat a round. In other words, do the round you've just done again, with the same number of DCs between each double DC. Then continue to increase by adding an extra DC between the double DCs in the rows that follow. When your circle has a diameter of approximately 28 cm (that's 11 inches - and this is a matter of preference: you can do a bigger circle, which will make a floppier hat). My hat reaches a diameter of approximately 28-29 cms (11.5 inches) when I've got 15 DCs between each double-DC. Depending on the weight of your yarn and your hook size, you might reach this size with fewer or more rounds than me. At this point you stop increasing every round and you start to decrease. 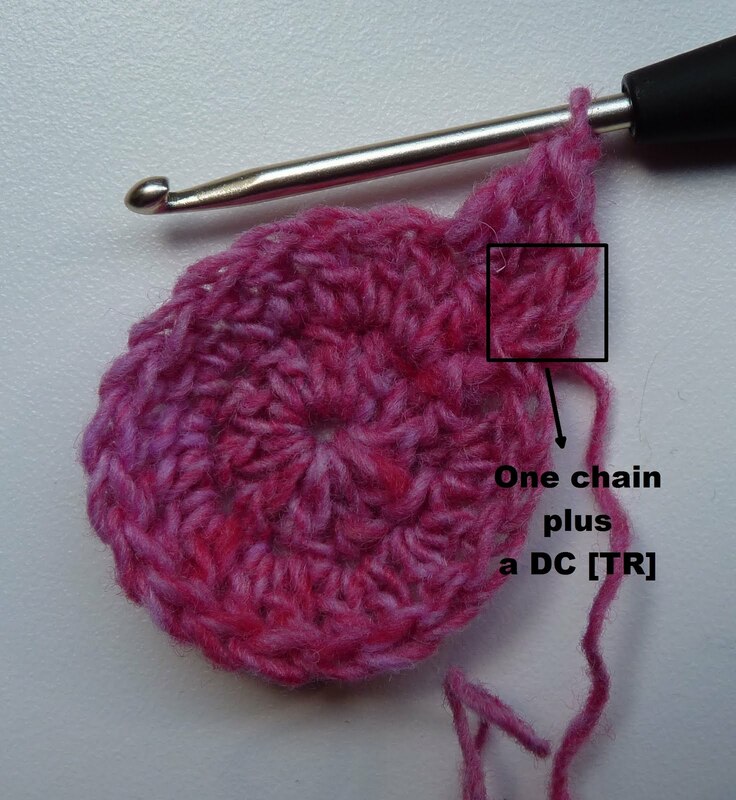 Round X: 1 ch, *1 DC [TR] in next ten stitches, 2-DC [2-TR] together. Repeat from * till you're back at the starting DC [TR] - and don't worry if you haven't finished after exactly 10 DCs, this is just an approximate value so that we decrease evenly thoughout. Join with a slipstitch. This time, curling is good! Curling is desired! You repeat round X again and again, and as you do, you see how the circumference of your hat is getting smaller. 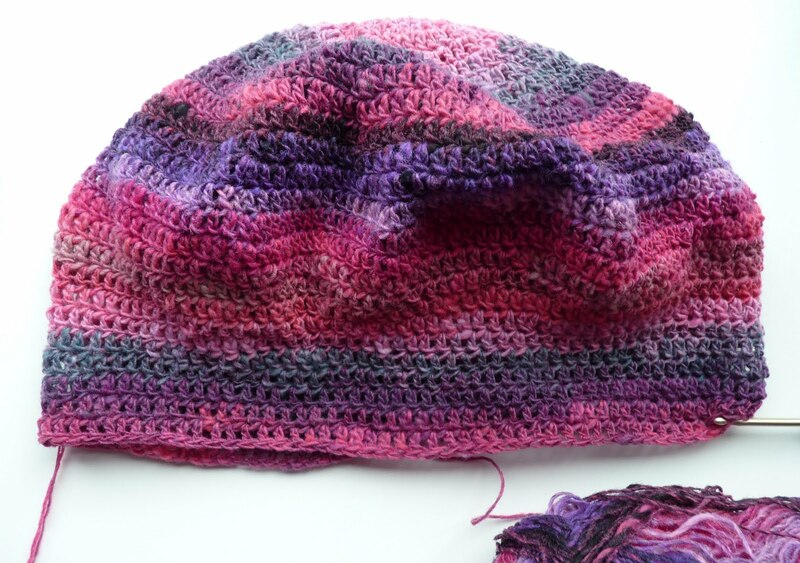 The 2-DC together basically makes one stitch out of two, and that makes the brim of the hat decrease in size as we do each additional round. 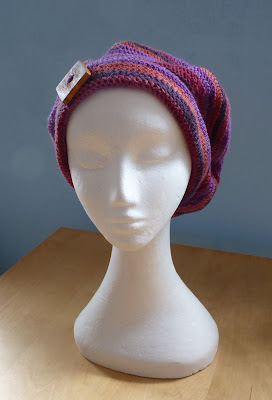 Pop the hat on your head now and again, and when it has reached the point where the brim sits snugly (but not too tight!) against your head, stop decreasing! 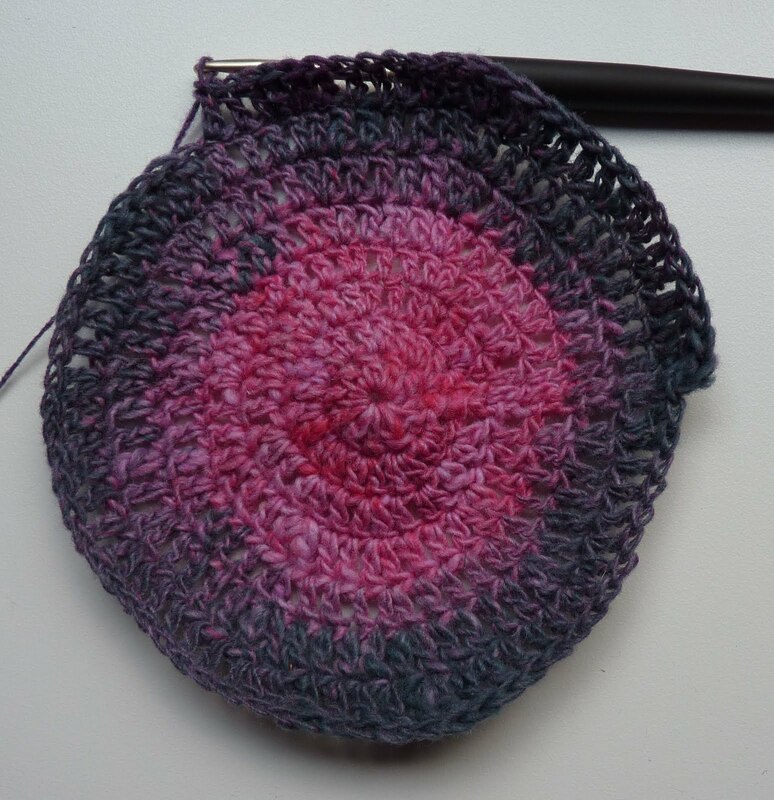 From now on, you just continue to crochet in the round, with one DC in each stitch. Continue till the brim is about 10 cm (4 inches) long, which is long enough to fold it over and attach a button. You may not reproduce this pattern in print or claim it as your work. You may not sell the pattern. Do not copy and paste pattern to another website, please use a link. And, obviously, if you make millions from making these hats, you have to give me a significant share. As I mentioned in my last post, Gingerbread Sister is getting married in a fortnight. She's probably reading this post right now, smug in the belief that this is going to be all about her, the bride. Anyway, this is my parents' dog, Zuppy. Like many dogs, he doesn't realise that humans tick differently to dogs: he believes that he's invisible if he can't see us (he'll crawl through the kitchen with his head down, trying to avoid eye-contact with my mother. If he can't see her, she won't see him. My mother good-naturedly plays along, strengthening his belief that he has super powers). He also underestimates our cognitive faculties on a regular basis (after he'd killed my father's miniature ducks in a fit of uncontrollable jealousy, he disposed of the bodies, Mafia-style, in a shallow grave. My parents came home from work to find the ducks gone and no sign of violence. The dog looked innocent and the cats were - as cats generally are - non-committal on the issue. Three days later, when our little human minds had long since forgotten the ducks' existence, he dug one of them up and proudly paraded his trophy by running around the house triumphantly, a dead duck in his jaws). He also tends to believe that Big Family Occasions are held for his benefit. In his honour, if you will. Now, few people understand the workings of a cat's mind, but dogs are like open books. When someone gets married at our house (and I have a lot of brothers and sisters, so it happens more often than you might think), there's a flurry of activity for days beforehand, as the outdoor loos and catering equipment and the wedding marquee are delivered and set up. The cats, inscrutable, view this with great haughtiness and an almost tangible air of suspicion. The dog, on the other hand, runs around the place with his tongue hanging out and his stubby tail waving wildly. "Hurray!" his little face clearly says, "Another party for me! Yippee!" And it doesn't matter that he gets shouted at at least four times an hour for trying to stick his nose into the caterer's barbecue or down the bowl of a portable loo, or for trying to climb up the step-ladder after the electrician - he's just so excited at the prospect of yet another party for him that his enthusiasm is boundless. That's right. On the day of the wedding, the cats will succumb to captivity - with ill-grace and a couple of scratched fingers, mind you - but the dog behaves as though we've taken out his little heart and pounded it off the pavement. He just doesn't understand why - why? - he has to be locked up. At his party. After all, he's been involved in all the preparations. He's helped set everything up. He's chewed the decorations and tripped up the plumber. Why? Just why? I know, it's heart-breaking. At one sister's wedding we tied him up on a long leash under an apple tree but he chewed through the leash ... and through the cable that led to the generator, which in turn was powering the entire wedding. The marquee was plunged into total darkness - shrieking and screaming - whereupon Zuppy made his triumphant entrance, his tail wagging and head held high. ("Hello, hello. Nice to see you again. Thank you for coming to my party. Yes, I'm here now. No worries. Lovely to see you.") He proceeded to do the rounds of the guests, snagging bits of sausage and steak, having his head stroked and told how wonderful he was (confirming once again that he has super powers), while Kevin the electrician and one of the Gingerbread brothers struggled in the darkness and rain to get the electricity going again. 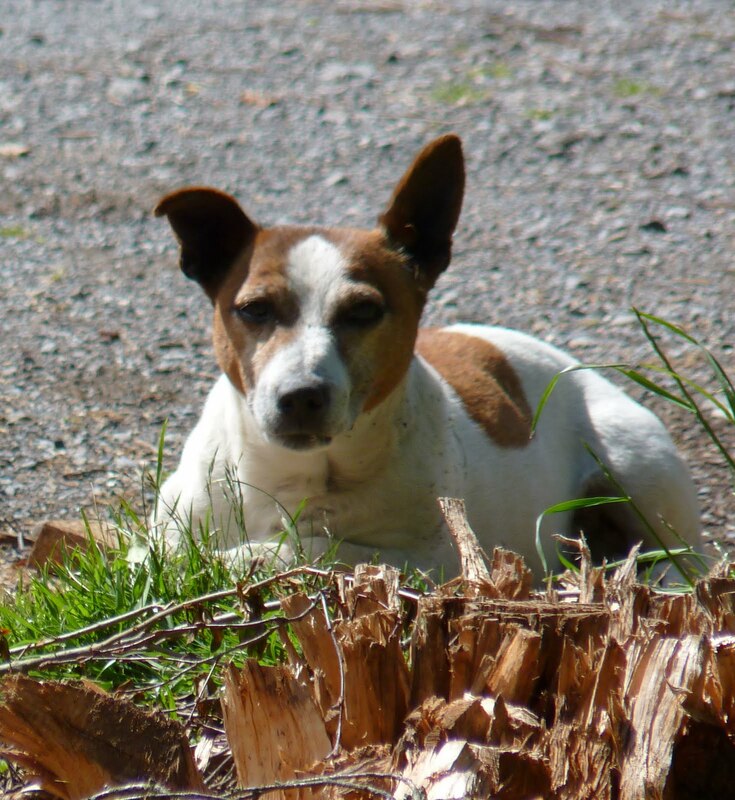 At our wedding, he was put into his brand-new kennel: a roomy house actually more suited to a much bigger dog than a Jack Russell. He alternated between howling out through the window of the house and trying to eat the door. Finally, another Gingerbread Brother - his heart scalded by the pathetic sight (and afraid the dog would actually swallow the wood of the door) - set him free and Zuppy trotted down to the marquee (ducking his head as he scuttled past my mother, certain that he was invisible again). "I'm here!" his face said. "Thank you ever so much for coming. Delightful to see you. Due to some sort of misunderstanding, I was sadly detained but I'm here now and am ready for my party!" And thus he spent the evening on a variety of laps (evident from the muddy paw prints on people's clothes in the wedding photos), eating a selection of hand-picked snacks and treats and convening with the band onstage (he's nearly deaf, you see, so he likes to be up beside the speakers, enjoying the vibrations.) All in all, I believe he had a good night. As the excitement mounts in the Gingerbread Parents' house, Zuppy may be getting an inkling that something is afoot again. In a week or two, he'll see the familiar sight of the caterer's van and he'll realise that we're planning another party for him. We may even have to accept the inevitable and realise that no matter what we do, this dog is going to attend - we'll have to just forget about locking him up. After all, we must not forget that he is the star of the wedding. Little Gingerbread Sister is getting married in two weeks. That means that, volcanos permitting, Mr G and I will travel home to Ireland for the thrill of an Irish wedding. It'll be a small affair: just close family and friends. And distant family. And friends' offspring. And neighbours. And relatives of neighbours. And anyone passing through, basically. In other words, I believe the numbers are now hovering at about 300. Our wedding two years ago was a similarily modest affair, despite stringent planning and a snappy bride (me) saying she was not financing a party for half the Irish countryside. Oh, dear. Tsk, tsk. I should have realised sooner that resistance was futile: at one point the Gingerbread Brothers presented me with a list of friends who were coming to the wedding, regardless of whether they were invited or not, and I was advised to bite the bullet and officially invite them, so I'd have "a rough idea of how many were coming". Aside from the invited guests and the semi-invited guests, there were also uninvited guests - two German tourists on holiday in Ireland, who knew someone in the wedding party - as well as a lovely young couple who turned up on the day with a present and had their photo taken by the photographer when they arrived. Their picture has been immortalised in my wedding album, but no one has a clue who they are. And, apparently, the day after our wedding (which was, in itself, a three-day affair), someone was overheard in a local pub, saying he'd been at a fantastic wedding, in a marquee at the Gingerbread Parents' house out in the countryside. Apparently, he'd said it was the best wedding he'd ever been to. We don't know who he was, either. The most exciting element of an Irish wedding is not the sheer number of people who will turn up for your shindig, but rather the weather. You might optimistically choose a date in "summer" (those quotation marks are laden with sarcasm), but that has no bearing on the kind of weather you're going to have. We got married in the middle of August. It was also the wettest day since weather records began in Ireland (and that's no mean feat). As we were bopping away to the wedding band, the fire brigade were pumping water out of a neighbour's driveway, as severe flooding had effectively rendered his family stranded. In any case, while we're sweltering in the heat over here, Ireland is experiencing a delightfully quirky July. That's a nice way of saying that it has rained non-stop for about three weeks. When I phoned Mammy Gingerbread last night, she reported that the rain was beating off the window panes. Again. But the Gingerbread Family are insouciant, blasé and nonchalant (haha, I knew that French thesaurus would come in handy) about the whole thing: we've held weddings during a cyclone, a volcanic eruption and a heatwave. We roll with the punches. But I'll tell you one thing: if you want to ensure that a couple stays together, then they ought to get married at my parents' house, Gingerbread-style. Because - I swear on all things holy - one Irish wedding is enough for a lifetime. 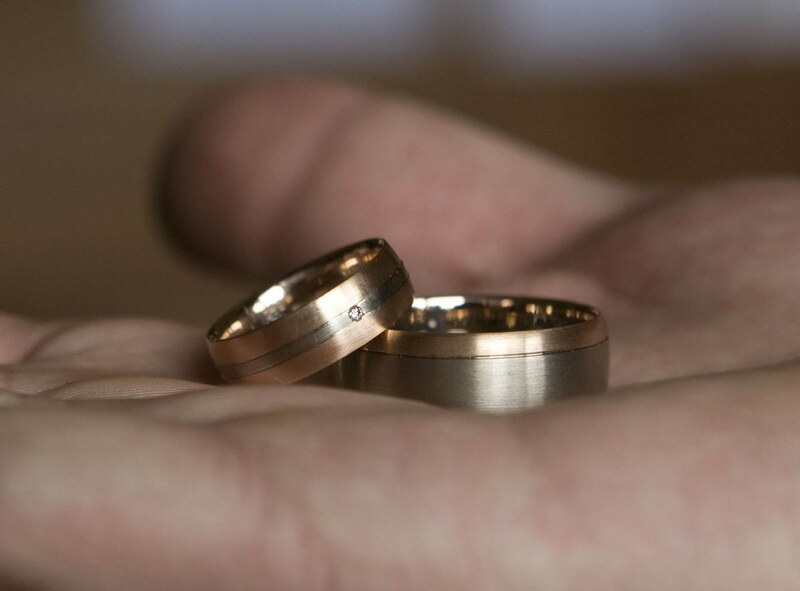 If you can survive your wedding day, the chances are good that you'll manage a good few years together. It's kind of a Nuptial Endurance Test. A bad day, I tell you. It was about 35°C (about 95°F) and this heat had rendered much of Gingerbreadtown's populace incapable of doing even the simplest of activities. As the temperatures rose, IQ levels sank: frazzled businessmen were seen angrily pushing doors with PULL signs on them. Mothers stood helplessly in the middle of the pedestrian zone, wondering where they'd left their offspring. Children were grizzling and whining in the heat, mashing their melting icecream cones in their hair and down the front of their T-shirts. 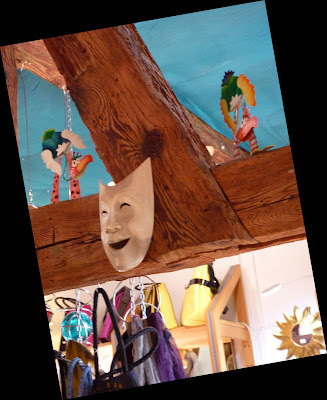 Yours truly, the Gingerbread Lady, was skulking along the sidewalk, ducking into the narrow strip of shadow thrown by the shop fronts. You see, I have Celtic skin - skin type A - the one that's characterised as the "often burns, rarely tans" type. If I'm exposed to the sun, I sizzle. I do: I sizzle. So during the summer I lead a vampire existence, out of direct sunlight or slathered in a film of Factor 50 suncream ("I didn't even know they did Factor 50!" said a friend in amazement. They do. It's usually for small children and babies, it's kind of like the spaceship shields they have on Star Wars). Insert hook into stitch of previous row, draw yarn through. 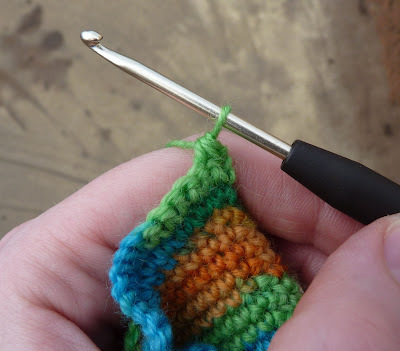 Put hook into the next stitch, draw yarn through. 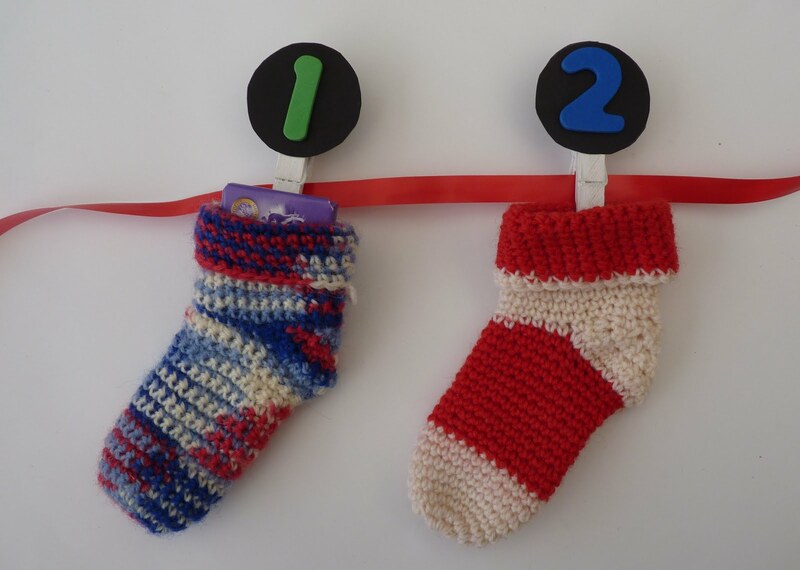 draw yarn through all three. Crochet three chain and join with a slip stitch. Round 1: Crochet 10 sc into the round. Join with a slip stitch. 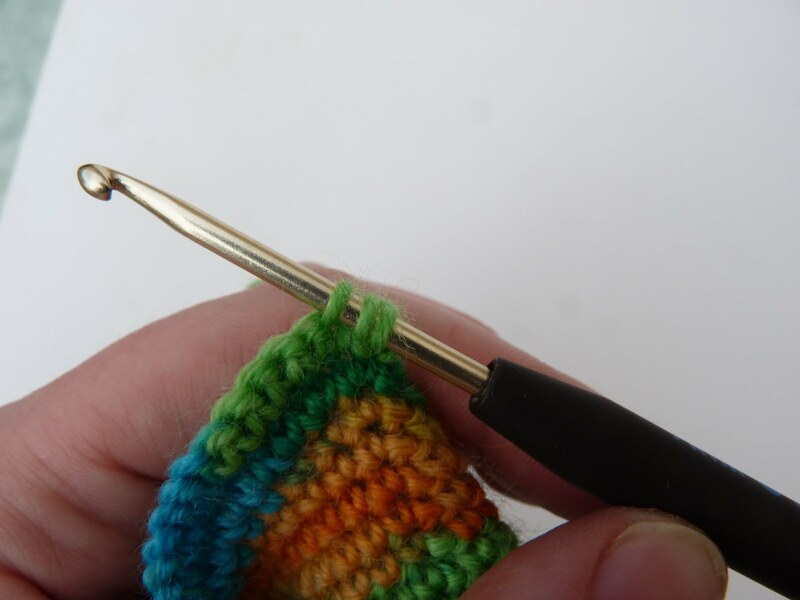 Continue to crochet in the round till the foot of the sock is about 8 cms long. Row 3: In this round you’ll decrease, till you have 15 stitches again. Slip stitch, crochet 2 sc tog. 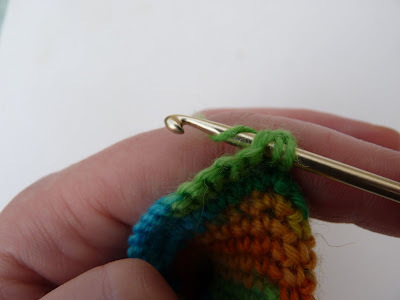 Continue across the row by crocheting two stitches from the previous row together, till at the end you have 15 stitches in total. 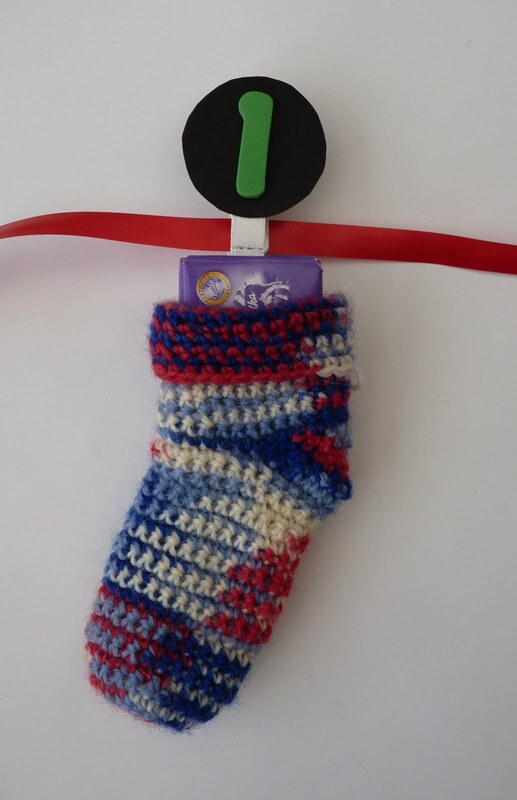 Row 8: Slip stitch, crochet 2 sc tog twice – you’ll have 2 stitches. Row 1: Crochet 7 SC [DC] along the side of the previously crocheted rows. This should bring you up to the other 15 stitches that you left aside when you started the heel. 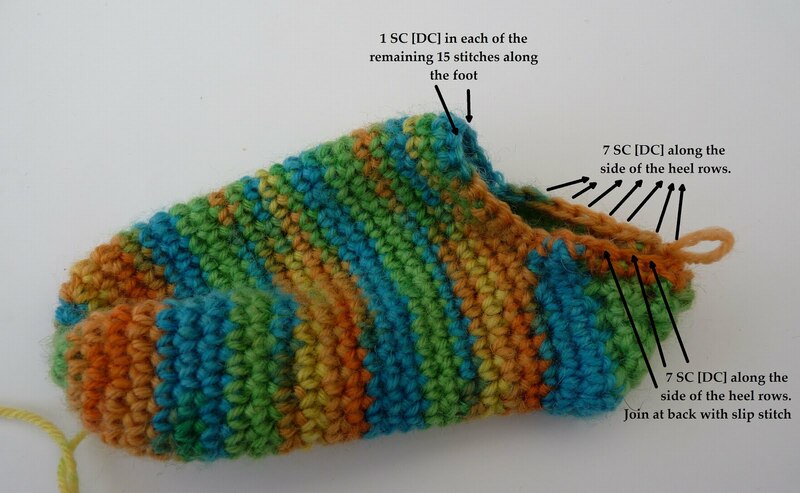 1 SC [DC] in each of these 15 stitches, bringing you back to the other side of the heel. Crochet 7 SC [DC] to the the first stitch in the round. 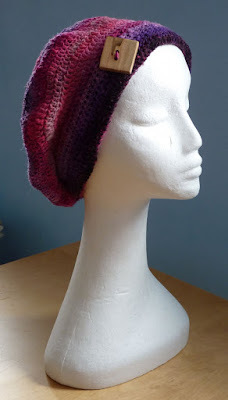 Join with a slip stitch. 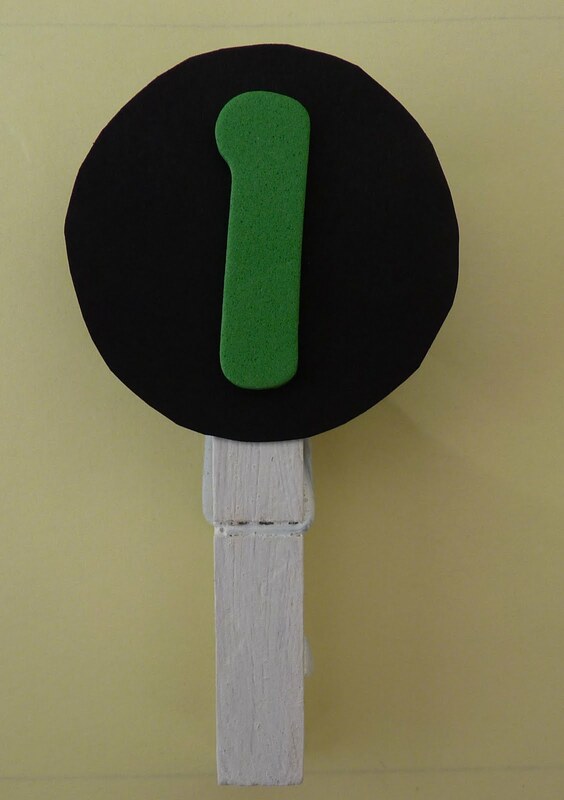 and draw, paint or collage the number on the circle. I've used foam stickers that I bought at a local crafts store. 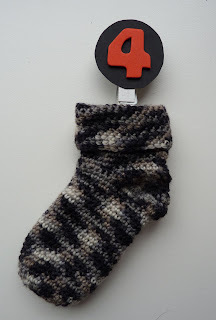 Add socks and peg to a long piece of ribbon or string. Tuck in a treat, sweet or small gift. Two down, twenty-two to go. Thankfully we still have a few months till Christmas! These seem really simple and they are cute. What is the easiest way to adapt them to a larger size? They are VERY simple! Really and truly - you might need to do a practice sock to get the heel down, then it's plain sailing. You could churn them out in your sleep. Baby sock patterns seemed very complicated to me and I really wanted a pattern that could compete with a knitted pattern in terms of the 'look' of the sock. 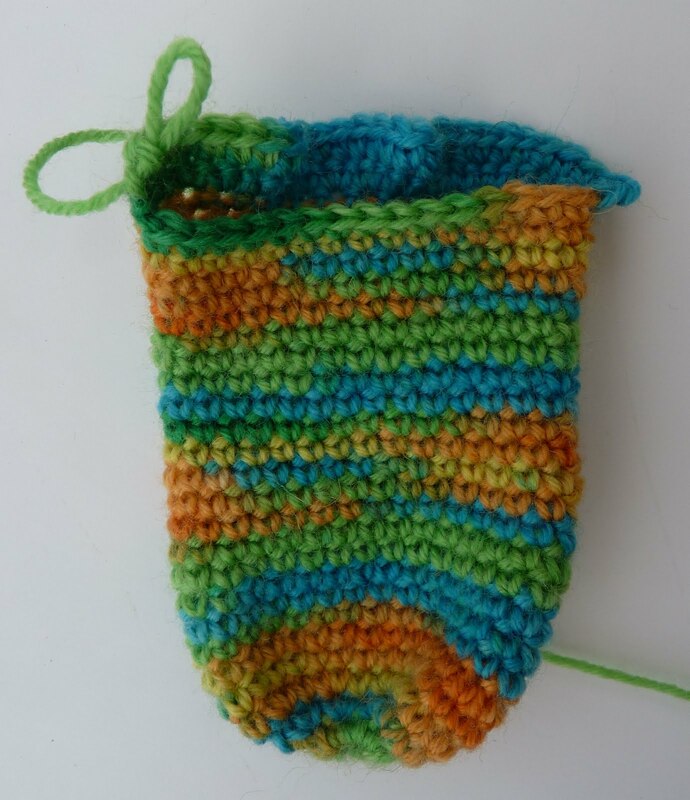 Single crochet is (IMO) best on a variegated sock yarn so you can see the yarn's stripes. 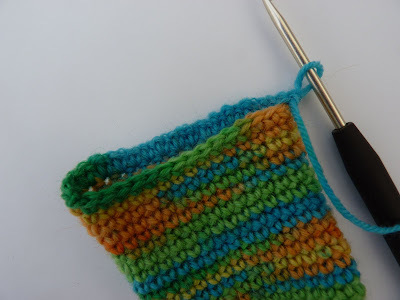 The simplest way to adapt them to a bigger size is to use a bigger hook and a thicker yarn - that's the cheater's version! 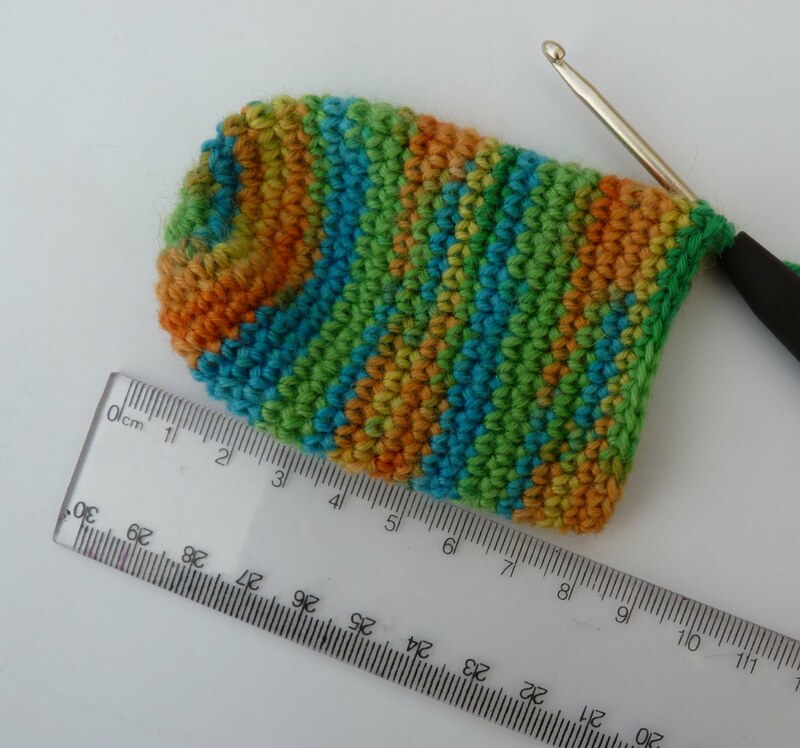 Use a 3.75 (F) hook or a 4.25 (G) hook and a thicker yarn, and that will give you a slightly bigger sock without any pattern-fiddling. 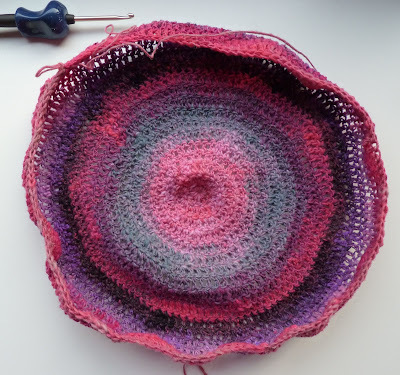 Otherwise you will have to experiment a bit with the number of SC you crochet in the round at the beginning, e.g. instead of 30, do 40. 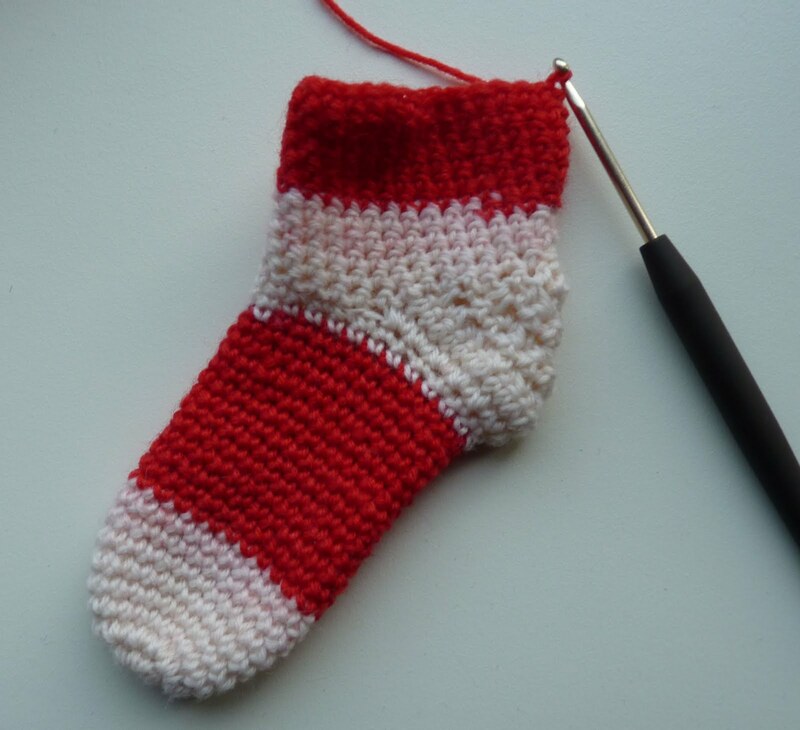 Crochet till the sock is approx. 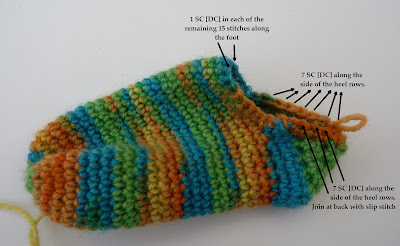 9.5 cm long and then start the heel by doubling the number of SC in 20 of the stitches (2 x SC in each stitch till you have 40, then a row with one SC in each of the 40, then gradually start to decrease by crocheting two together in every other row.) Then crochet around to form the ankle as above. This morning I wrapped my two cushions. They're for two of my colleagues, both expecting babies - and on the same day, to boot. There's something very nerve-wracking about gifting an item you've made yourself: What if they don't like them? What if they generally don't like handmade stuff? 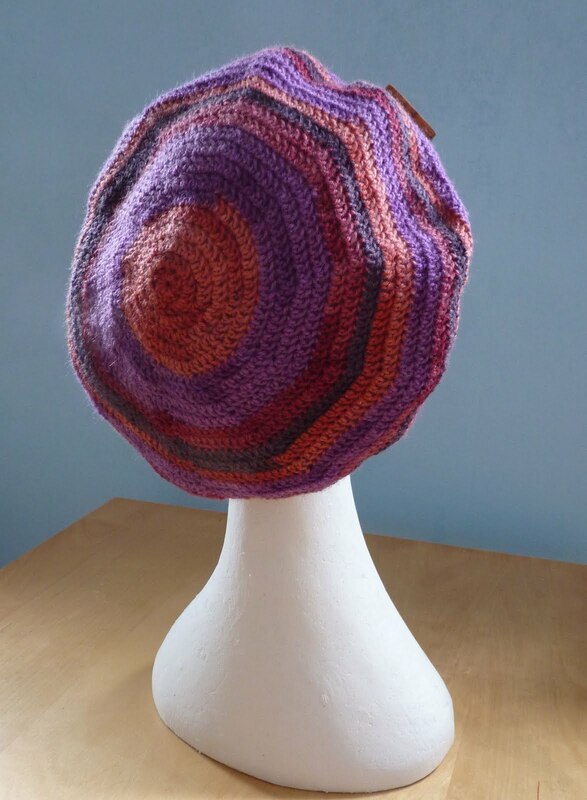 What if they think crochet is tacky or kitschy or some other derogative adjective that ends in -y? It feels quite personal somehow and I find it quite unsettling. My gifts are generally given under tables or left in bags in the corner with a mumbled instruction that the recipient should look inside, there's just something small in there - just a token, just a gesture. Nothing fancy. While some people will look at and appreciate the time and effort put into a handmade gift, others will always regard the handmade item as ... cheap (you didn't even bother to buy a gift!) or - curl your lip as you say this - homemade. The sad thing is that the latter type are often the ones who'd be willing to fork out a fortune on the same kind of object ... if it had the right label. As a result, I try to wrap my work as nicely as I can, label it appropriately and present it well - figuring that if I show my work respect, others will see its value as well. And it seems to work: my preggy colleagues were very happy (or very good actors: let's not rule it out) and other bystanders were also impressed. Lots of oohing and aahing. I was even told that my work was so nice, I should do it professionally! Make cushions and blankets and all kinds of colourful stuff! I smiled and said gently, "Well, that would be really, really lovely but ... if I did, I'd probably only earn about 50 cents an hour." "Really? How long does it take you to make something like that?" Honestly? I don't know. "About seven or eight hours in total?" I ventured. 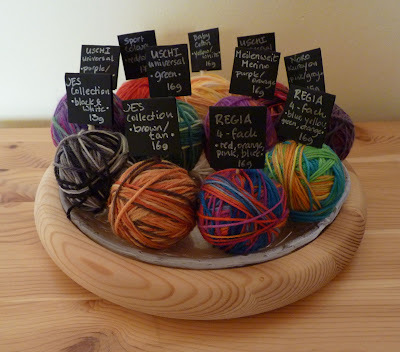 "And then there's the cost of the yarn, the fleece, and the cushion itself," I added. "So I'd probably have to charge about €100 per cushion to make minimum wage." Nervous laugh. The weird thing about the whole escapade was that I had a bit of separation angst when I was wrapping my cushions. 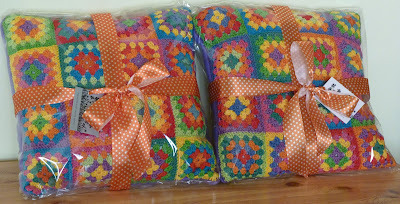 One part of me didn't want to give them away, I had a bit of an inner sulk ("They're my cushions! Mine! I made them, they belong to me! Mine!" Foot stamp). I have to watch that - otherwise I'll end up like one of those messies: living in a house with stacks and stacks of crochet cushions, burrowing tunnels to the door.